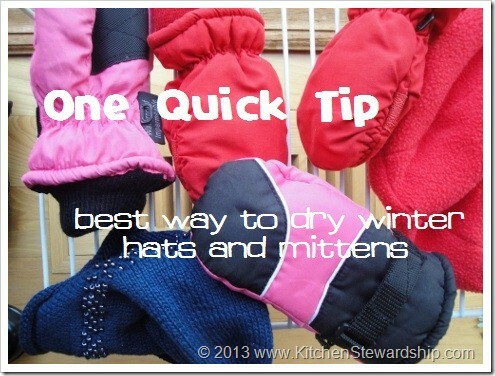 Rather than having all our winter hats and mittens stay soggy in a basket OR be simply on the floor near a register vent, and without having to put holes in the wall to hang them up nicely (which would take us until summertime to “get around to” at the rate we do household projects! ), I set this up in 60 seconds. I figure the air flow is improved and the kids have totally loved the routine of having a definite place to put them. The 7yo boy learned that Mom is super smart the day he was lazy and left all his stuff in the garage – talk about COLD mittens and boots, and a still snowy coat and snowpants! Browse the rest of the series for more simple, pictorial posts that will only take 60 seconds to read. You can follow the One Quick Tip pin board so you don’t have to read the longest posts in the world but still keep up on the tips, things that speed your day along, increase nutrition in the kitchen, or make life more manageable in some way. Of all the encouraging comments I’m getting on Better Than a Box, it seems people most appreciate the small strategies that can help them be more efficient with their work. Notes: Check out this week’s giveaway for a $270 valued organic food storage kit, and don’t forget the code BTBMINI-40 for 40% off The Everything Beans Book through Sunday! This is genius! Having just moved up to the semi-North and had my kids in snow for the first time, this is much appreciated. I hooked gloves and ski masks to my octopus lingerie hanger from Ikea last week, hung it over the baseboard heater in the bathroom, and cranked the heat in there while closing the doors. What you’ve put up is a much more comfortable solution, and one they’ll be able to do instead of me! Genius! Why haven’t I thought of this? That is great! 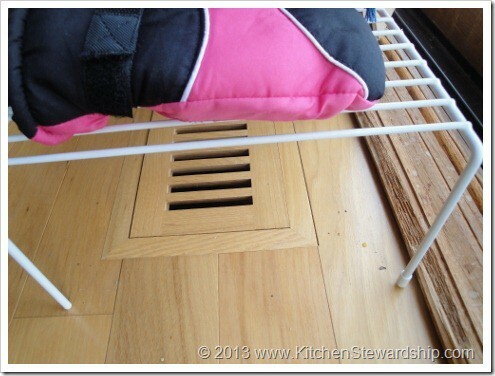 The vents in our current house are on the ceiling – so for knit ones, I just put them on top of the toaster oven.